Every university - including TU Delft – or a big city invariably has a few of these labs. But what are they exactly? And is the hype justified? Home of Innovation spoke with researcher Jasper Deuten of the Rathenau Instituut, who has studied the phenomenon in depth. In Toronto, Google’s parent company Alphabet is building a futuristic residential neighbourhood where everything is connected via cameras, sensors and the internet. -eQuayside project promises a revolution in the area of urban development. Selfdriving cars, robots that collect household waste, toilets that keep track of water consumption, heated bicycle paths to keep out snow, and many other innovations in the areas of sustainability, mobility, housing and public facilities are expected to dramatically change the streetscape. Here, everything is measured. A city as a platform, which uses its residents’ data to tweak their living environment further. The city as one big experiment, for learning how to best organise the society of the future. Something similar is taking place in Amsterdam. The former industrial area of Buiksloterham is being transformed into a sustainable residential area. Various parties, including residents and research institutes, are involved in developing this area into a ‘circular neighbourhood’, where all products and raw materials will be recycled to the maximum extent. 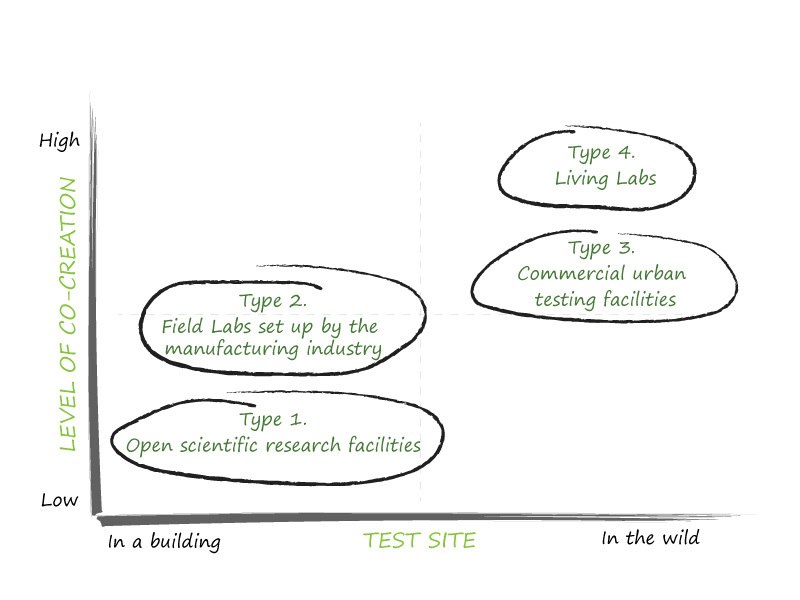 At Delft too, we are witnessing a shift from controlled, lab-based experiments to experimenting ‘in the wild’. In The Green Village, which is a part of the campus that has been declared ‘rule-free’, new building techniques and other innovations are tested in a lifelike environment. For example, student accommodation is rented out with the purpose of testing new materials and energy-saving measures. The students make sure that the houses are thoroughly tested, providing valuable information to researchers. The three examples described above have a common denominator: all of them are so-called living labs. The concept of living labs has become increasingly popular in recent years. Leaving the traditional research laboratory behind, researchers are venturing out into the wider world. In the process, gas burners and test tubes have given way to big data and algorithms. Living labs are a new way of developing and applying knowledge. It is not just about technical progress, but also about social innovation. Today’s guinea pigs are ordinary citizens and their data - that’s what it’s all about. Living labs are ‘hot’, but what exactly are they? Why are they emerging now? In what way do they differ from field labs, which are also on the rise, and how are government and industries involved? What role do living labs play with respect to technology transfer? Do the labs really add value or is it simply a hype promoted by cities and companies eager to clean up their image? Jasper Deuten from the Rathenau Institute has studied the phenomenon and he is quite optimistic. According to him, living labs can “genuinely contribute to finding a solution to the major social challenges of today”. The Rathenau Instituut has made an inventory of all the initiatives claiming to be living labs. Four basic types have been launched so far, only one of which actually qualifies as a living lab. The other three are commercial urban testing facilities, field labs set up by the manufacturing industry, and open scientific research facilities. The four types differ in terms of collaborating parties and the ‘lifelikeness’ of the setting in which the experiment takes place, explains Deuten. Real living labs take both aspects to the limit. “There is a whole range of partners involved,” he says. “Not just knowledge institutions, companies and government bodies, but also end users, citizens or social organisations.” Living labs involve all the different parties required for identifying solutions to social issues. Moreover, these labs are often found in urban environments. “In cities, we often see multiple problems come together, and living labs are a particularly suitable tool for addressing these types of complex problems.” In short, living labs carry a high social component. Deuten attributes the emergence of living labs to a number of recent developments. Firstly, there is the ambition to tackle truly complex social issues, where technological innovations can only provide a small part of the solution. “Some of the living labs we studied deal with poverty in neighbourhoods or low literacy levels. In such cases, sheer technological solutions just won’t do.” Nevertheless, technology plays an important facilitating role. Smart algorithms, increasingly smaller sensors, more powerful computers and mobile internet are turning the city into a so-called robot network, where people and devices are connected seamlessly. The Internet of Things enables real-time measurements, so that the city can also be used as a laboratory. Living labs have also emerged because urban and regional authorities are pursuing an increasingly active innovation policy. In part, this is prompted by local economic policy and the development of regional ecosystems, which are good for employment. But it is also partly motivated by the ambition to solve social issues, says Deuten. Complex social issues can be best tackled at a local or regional level. The national government can play a significant role in scaling up solutions from local experiments. It is quite clear that both government bodies and knowledge institutions could benefit from living labs. But what's the catch for companies? The commercial benefits of living labs are somewhat less prominent than those of urban test facilities or field labs, where the testing of prototypes and the training of personnel are of central importance. Participation in living labs often involves a certain degree of corporate social responsibility, adds Deuten. "But here too you see that, for companies, a good business model is often important for scaling up solutions from a living-lab level. Companies want solutions that can also be sold elsewhere." When it comes to the valorisation of knowledge, each type of lab contributes in a different way to making new knowledge available for social innovations. Open scientific research facilities are 'classic' valorisation tools, according to Deuten. "You've performed research on something and you also want the world to benefit from this in some way. You can easily facilitate this by opening up the lab to the business community and giving companies access to the knowledge and research facilities." In field labs, the emphasis is shifting from scientific research that needs to be translated into innovative products, to companies that want to use new digital technologies in their production process. Field labs such as RoboHouse are intended to help manufacturing companies implement new production technology. In contrast to this, living labs focus on the joint development of solutions for social problems. Every partner - university, government, industry, citizen, social organisation - is part of a co-creative process for finding solutions. Knowledge valorisation through collaborative knowledge-building, as Deuten describes it. So although living labs can undoubtedly contribute to solving social issues, Deuten still has a few recommendations to make in this area. An important challenge is to ensure that living labs do not remain limited to isolated bouts of enthusiasm or one-off initiatives. For this, it is useful if the data from different living labs are collected in a systematic way and made accessible to other living labs. In addition, it helps if living labs are set up as part of a coherent group of experiments. "Researching something in Amsterdam, Groningen and Twente at the same time will yield much more robust knowledge than if you limit yourself to Amsterdam alone." Other aspects which, according to Deuten, need further attention are the ethical and social aspects and the establishment of good practices for living labs. "Citizens should not become part of a living lab without them being aware of this and unwittingly be monitored all the time." When you work with test subjects, there are certain ethical aspects involved. "It's much the same as working with lab animals: you can't simply use them any way you want." To ensure that living labs are accepted by society, it is essential to set out clear rules for such labs. The reverse is also true: living labs may lead to a feeling of exclusion. "Why is there no living lab in my neighbourhood? I also want a living lab!" There is a big hype around living labs. Various cities and regions profile themselves as living labs. Is that actually justified? This raises questions in Deuten's mind as to what really con-stitutes a living lab. The key question here - to separate the wheat from the chaff so to speak - is whether any real experiments are being carried out. "If it is not set up as an experiment, then the word 'lab' does not make sense." The Green Village, however, can justifiably be called a living lab, according to the researcher. There are several parties involved, it is a lifelike experimental environment and the residents, i.e. the students, are taken seriously as co-developers of knowledge. "To me, this seems like a good example of a living lab."